The opening of the latest 5 th edition of Harry Potter organized by Narn Mee Books Co.,Ltd., recently has drawn a mass crowd, who takes the fancy for the leading actor, Harry Potter. Sprinkle has also brought pleasure for these famous novel fans with its 200 cc. Bottled cups as a gift. Gaskets will seal flanges where temperature, pressure, vibration and flow rates are beyond the capability of conventional jointing materials. They are used worldwide for pipelines and pressure vessels on steam, petrochemical, nuclear, marine and hydraulic plant, as well as on heat exchangers. High integrity sealing for pipelines and pressure vessels. System pressures: high vacuum to 350+bar. Material combinations for all operating conditions. 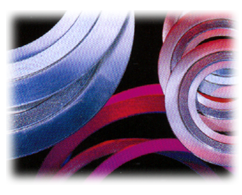 Spiral wound gasket that seals efficiency at limited bolt stress. For Classes 150 and 300 flanges. copyright © 2004 HI TECH SEAL CO., LTD. All right reserved.